Quick overview: The SMART Recorder is a “screen capture” tool that allows you to record yourself teaching on your SMARTBoard. For those of you who are regular readers of my blog, I use a similar a technique to create the step-by-step video tutorials you see each week. The best part (that I saved for last) is that the SMART Video recorder is really easy to use! What is required? The SMART Notebook software and a microphone. A video camera is NOT required. A USB drive is recommended for storing the videos. How can it be used in the classroom: Using the SMARTBoard, you would record yourself teaching a lesson. Anything you write (or say) while teaching on the SMARTBoard is captured by the computer and then automatically packaged into a single video file. You could then provide your students with the video file at the end of class. The students could take home this video file (on a USB drive or sent by e-mail) and watch it as many times as they would like. This approach may be useful for students who have difficulties taking notes and listening at the same time. What about in an individualized classroom? If you often find yourself explaining the same concepts, why not create a small bank of video tutorials? If your students are receptive to learning with video, you could provide one of these videos to a student (explaining a particular concept) and then circulate around the class to help the others. Once your student is done watching the video file, you would come back and see if anything needs further clarifying. What do the final videos look like? Here’s an example video (click here to see) that was created by Mark Frost, a math teacher in the Eastern Shores School Board. 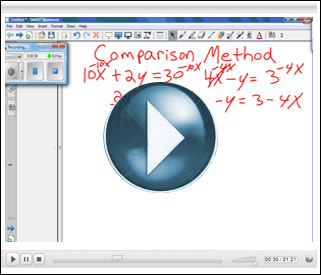 Mark has created a bank of math videos for students in his individualized classroom using the SMART Recorder. If you’d like to get in contact with Mark Frost and discuss using his videos in your own classroom, please let me know. This entry was posted in IWB and tagged individualized, iwb, recorder, screen capture, smart board, smart recorder, smart video recorder, SMARTBoard, video capture, video recorder, video tutorial. Bookmark the permalink. Hiya, I’m really glad I’ve found this information. Nowadays bloggers publish just about gossips and internet and this is actually annoying. A good site with exciting content, that’s what I need. Thank you for keeping this website, I’ll be visiting it. Do you do newsletters? Can not find it.